Who are these notes for? They'll probably be of most interest to Pilot rated, inexperienced mountain XC paraglider pilots who have decided to try this flight. What are these notes for? History has shown that pilots can underestimate this extremely popular XC route. Please don't think that reading this is enough preparation for this flight, it's definitely not. These notes can't cover all the situations you may encounter on this unpredictable flight and it's not a comprehensive XC guide. There are ideas on how to properly prepare for this route at the end. On the day, you'll need to assess the conditions and use your own judgement to make a safe, successful flight. However these notes do highlight some common XC considerations when attempting a flight from Clough Head to Ambleside on a typical Clough' day. The flight presents many of the XC challenges found on any route through the hills. So these notes encourage the application of general XC pilot skills to the various mountain features mentioned. This thinking and any experience gained on the flight can be usefully applied to other mountain routes. However, there is also a little local knowledge here that might inform your decision making. Maybe there's something here that you'll find helpful? Where have the notes come from? Prompted by a scary second flight on this route I discussed it at length with some of the local experts and plenty of helpful advice was proffered. I learned some valuable lessons. This is probably the most attempted XC route in the Lake District but it is a poor choice for your first mountain XC. Local expert and Chief Coach, Dave Ashcroft, grades the route as 'Hard' in his local XC guiding brief. You should get some appropriate mountain experience first. Jim Bittlestone - "I really do think that it is a difficult flight, probably one of the hardest I've done so far. As with any flight, conditions mean a lot, but the topography of a ridge plays a part too. I've heard it called the 'milk run' which does not do it justice, it wouldn't be my choice for a first XC that's for sure, so many variables, so many potential dangers". Mike Cavanagh - "It is a big, unpredictable XC flight, along some of the biggest mountains in England. Pilots should notice the subtle, and not so subtle, changes in terrain that could have consequences on their flight. Study a map before flying it. Pay attention to the overall change in orientation of the ridge once you get past Browncove Crags. Don't get blinded by the sight of Grasmere or Ambleside. If you feel uncomfortable keep plenty of space between you and the ground. Sacrifice the flight for comfort." These notes assume you'll start your flight by soaring at Clough Head. Wind direction between W and NW. Ideally it'll be sunny with good thermals possible. Wind strength up to moderate. If the wind is stronger, this XC flight might not be your best choice for the day. Ed Cleasby - "If attempting any route that leads into, or uses the high fells, exercise caution if the wind speed is above 12mph at the lower launches." Geoff Moss - "I flew in a rough and strongish NW. A mistake. Inexperienced flying in mountains with that much wind, I thought that leaving the Helvellyn Screes in a good thermal would keep me clear of trouble. 450m south of Browncove Crags at 975m asl my ENB glider span in bad air and dropped for a very frightening 15 secs before regaining normal flight"
Chris Scammell - "When you double the windspeed, the energy in the air is quadrupled. So going past Helvellyn when it's blowing 10mph is a very different affair to when it's blowing 20mph". If the wind is strong or the air just feels unfriendly whilst soaring at Clough Head, perhaps you should wait for a better day? Always pay attention to the wind direction. The mountainous terrain and the route's proximity to the sea mean the wind direction may vary significantly throughout your flight. e.g. You might leave Clough Head in a NW but find yourself over Grasmere in a southerly. The sea breeze generally pushes in from the north west then down the Thirlmere valley and from the south up towards Dunmail Raise. Strong convergence may occur above the Helvellyn range. Monitor the clouds and lakes for clues as you progress. Always keep a close eye on cloudbase height. The soaring might be comfortable at Clough Head with a fair gap between the ground and clouds but the hills are bigger further down the run. If you're not careful you could find yourself in strong lift, near Helvellyn's summit, with reducing ground speed and cloud too close for comfort. Don't just follow other pilots over the back of Clough Head. Some won't know what they're doing and it's too easy for the unwary to get into trouble on this route. Do your homework. The main ridge from Clough Head to Browncove Crags faces west and roughly into wind. However it has many big bowls and deep gullies. The more north there is in the wind the greater the danger of rotor from those features. Be careful not to contour the terrain into areas where rotors might be present. eg. In a NW wind the SW facing slopes below each of the three Dodds are probably best avoided. The tops of the bowls form dips in the main north-south ridge crest. They are natural venturis, so watch your ground speed anywhere near them. The long slopes on both the east and west sides of the main ridge can generate good thermals. Landing: It's often possible to land on the fell side but rocks may be hidden by the grass. The valley floor can provide more friendly options. The valley temporarily narrows just north of Legburthwaite. The more open sections further north and south are probably easier. After Brown Crag and White Side, if not already high, Browncove Crags may be the last chance to get enough height to continue safely. Browncove Crags - Should I stay or should I go? The forest in the valley below Browncove Crags runs for 4.5km alongside the eastern shore of Thirlmere. No easy bottom landings. This fact alone should encourage you to get as high as possible here. If you're already high, you might safely fly by overhead. However many pilots arrive at Browncove Crags lower, making this a key decision point on the flight. If you're not confident about continuing then it's usually a straightforward glide to the valley below. Many XC flights end below Browncove Crags before the forest begins. It's clear that the 150m high, rocky buttresses of Browncove Crags could create turbulence. Scratching or flying low over them might be a bad idea. 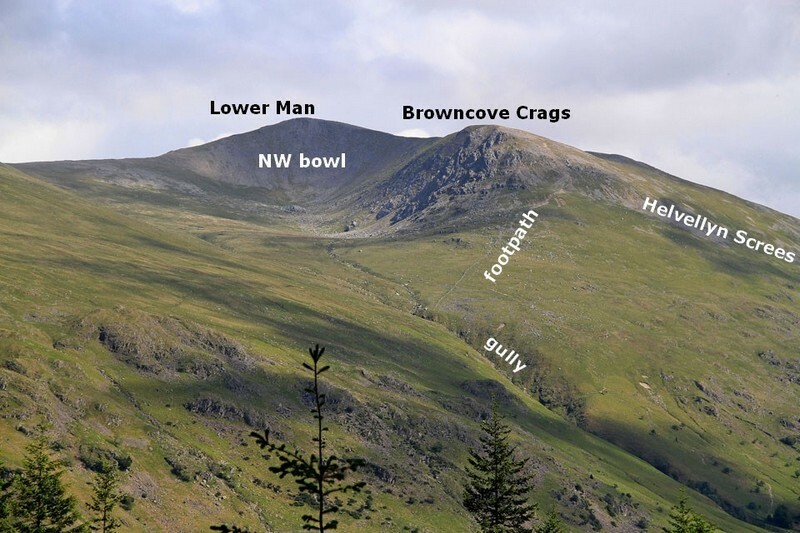 Immediately south of Browncove Crags is a SW facing rocky slope (by Helvellyn Screes) running up to Lower Man. This will catch any sun and may be slightly out of the wind. A few hundred metres further south are the slopes of Whelp Side. Also in sun, these sweep from the valley floor to the summit of Helvellyn. 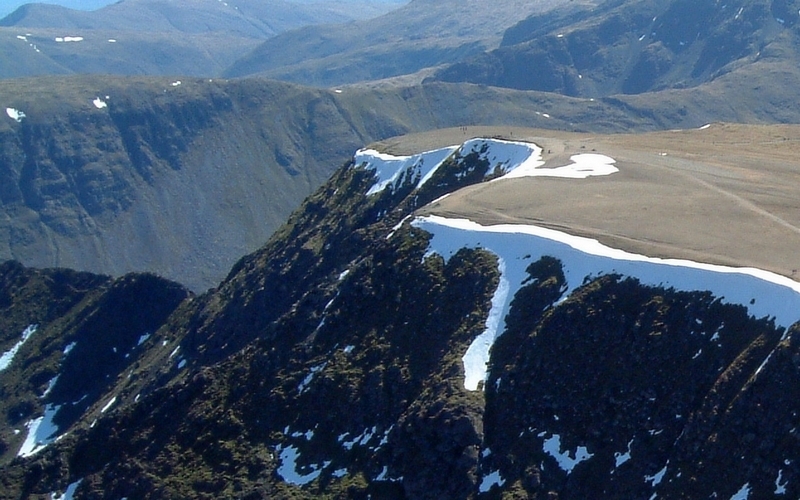 The steeper slopes of the Helvellyn Screes narrow the valley and will accelerate any wind. This topography, from the Crags through to Whelp Side, has the potential to produce both significant thermal activity and dynamic turbulence. Pilots often report rougher air round here. The turbulence can be very dangerous in stronger conditions. Judge the conditions carefully. However, if conditions are friendly you might get your best thermal of the day here. Jim Bittlestone - "At Browncove Crags I got a welcome lift and used every bit whilst checking out the next bit. 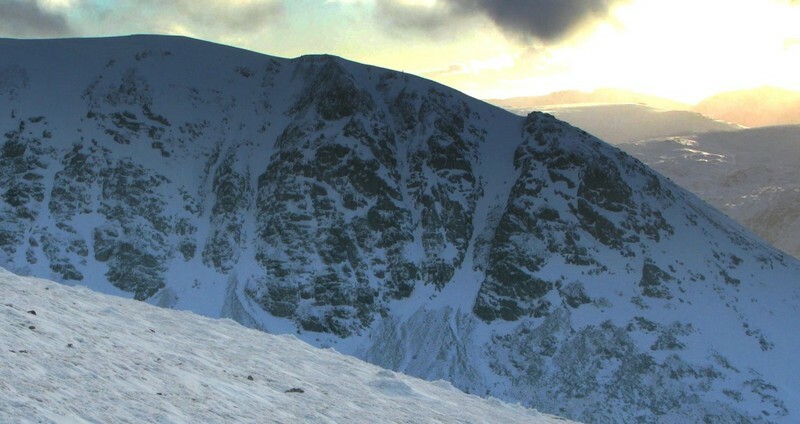 Great views over Helvellyn summit. If you are not high by now its time to land at Thirlspot, in my opinion, as the next stage has trees, water, accelerated valley wind, surface turbulence and rocks. Just my opinion with very little experience." Many pilots will try the NW nose above the footpath that runs over the crags. Low down, any wind will tend to flow down the valley (south) and can make things rough close in. So don't scratch the gully! Going past the nose low, above the forest, is also asking for trouble. Looking to Lower Man and into the NW facing bowl. The NW 'nose' of Browncove Crags to the right. "...you are likely to encounter a lee-side thermal which will feel jolly rough and may lead to collapses etc. ...give yourself the margin of height to encounter the lee-side thermals a bit higher up where they are better formed and less turbulent." - Chris Scammell. "...if the wind is fresh then do not approach this bowl." - Dave Ashcroft. 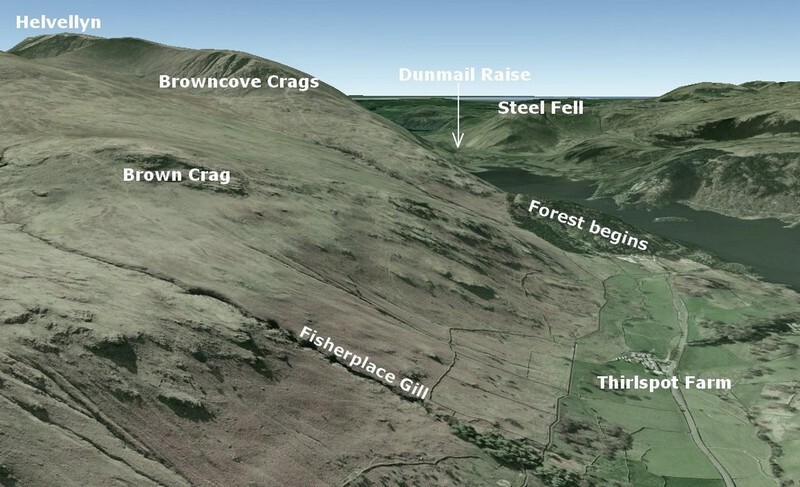 Note that the slopes of Whiteside Bank and Browncove Crags are almost parallel to a NW wind. In a moderate wind they can both can cause rotors and sink. Keep clear of this turbulence entering or exiting the bowl. So unless the wind is light, only approach the scree filled bowl in a NW. The lower slopes of the bowl are very shallow so ensure you've enough height to contact the steeper, scree covered top third, which can work. Monitor ground speed, particularly higher in the NW bowl. Nearby thermals may quickly add to the prevailing wind. To be blown back over the rocky precipices on the east facing slopes of the main ridge would be bad. However, if you do get high you might consider continuing south towards Ambleside. Don't leave Browncove Crags without good height. Bottom landings are best avoided until well past the forest. 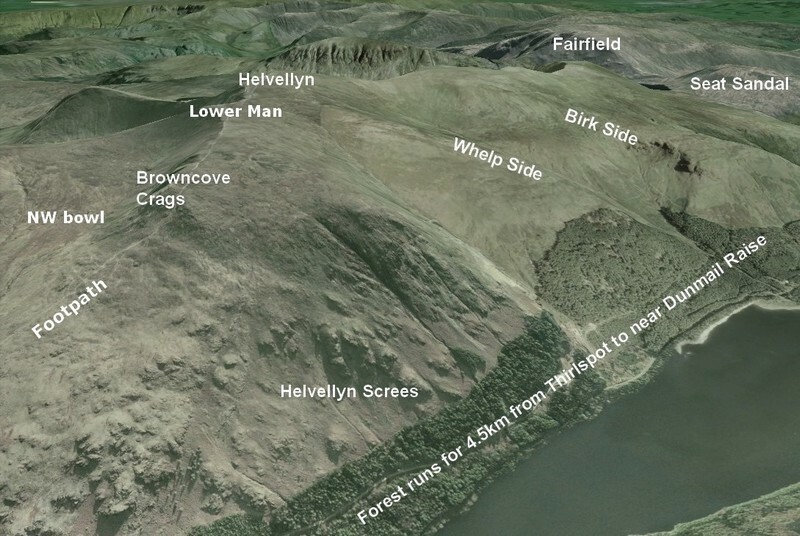 There is no wide, friendly shore by Thirlmere and immediately after the forest is the narrowest and highest part of the valley, Dunmail Raise. Any wind will rush through this model venturi where the rough valley floor is sprinkled with rocks. Dave Horne - "On a rather overcast light WNW day I left the slopes above Helvellyn Screes at about Lower Man height in virtually zero wind intent on a sledge ride to Grasmere, only to land in a stiff southerly near the top of Dunmail. C-line collapse saved a dragging but beware - there are a lot of boulders up there!" So, if you're losing height, stay far enough above the ground to avoid any turbulent air spilling off the big folds in the valley wall. 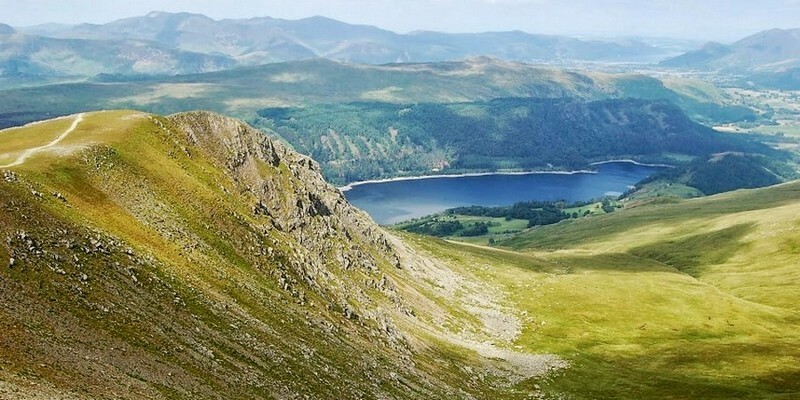 Brian Doub - "I've always considered the Helvellyn range as running due North and South, when in fact it doesn't. 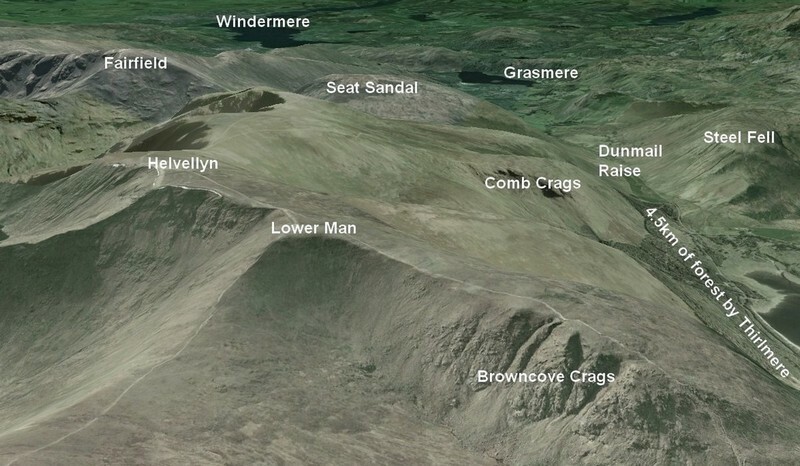 So when flying this run in a NW and scratching anything South of Helvellyn I'm in the lee side of everything! No wonder I get a thumping." Approaching Dollywaggon Pike a sea breeze may not be far away. Mike Cavanagh - "...the wind can be SW once you are past Dunmail, even when you thought you had been in a reasonable NW wind previously." Near Dollywaggon Pike you may see some pilots on Fairfield and others heading west of Seat Sandal. 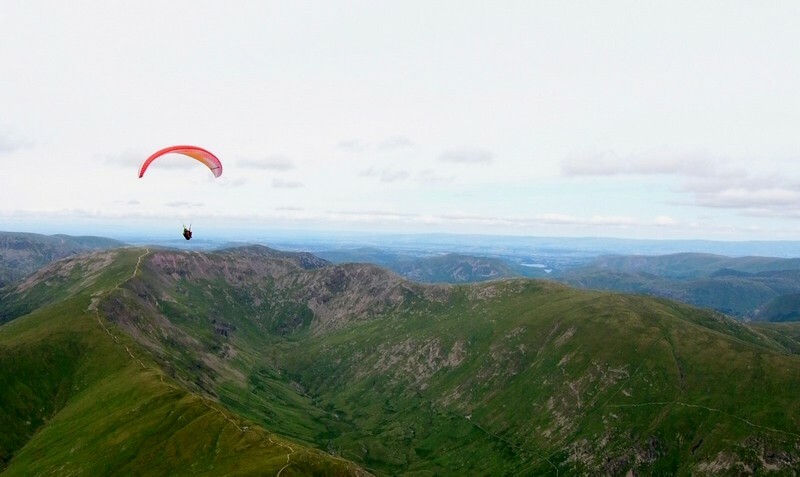 Flying to the west of Seat Sandal, over the main valley, is the safer option. If a sea breeze has come in then the area from Fairfield to Dunmail Raise can become a mixing area between the prevailing NW and the sea breeze. 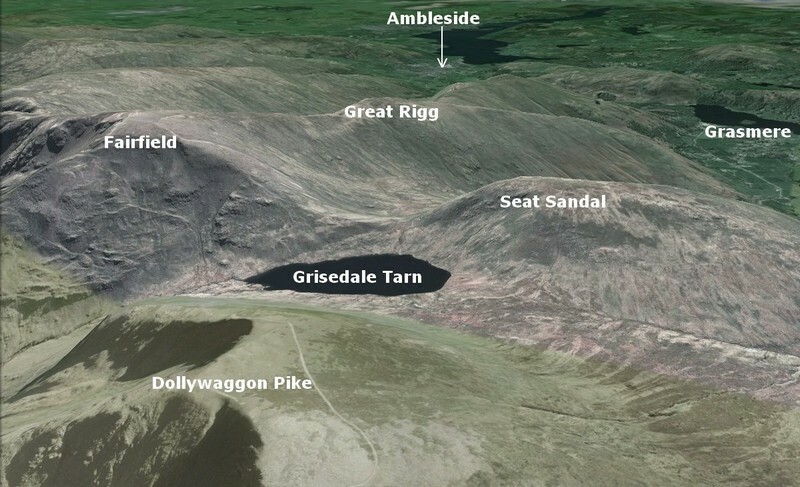 Anywhere near Grisedale Tarn could be a particularly bad place to be. Also, any NW facing slopes that you might have hoped to gain height over may become poor places to fly. Even in a NW, Fairfield is probably best left for more experienced pilots. With any wind, the air flow around Fairfield can be unpredictable. Get it wrong and you could end up dangerously in the lee of Seat Sandal where there can be a nasty mix of strong thermals and rotors. Even if the surface of Grisedale Tarn suggests that the wind is directly on Fairfield, it's a very narrow lift band on the west corner, where the wind splits along the contours. Also, in a NW "...even if you are above the ridge, you can get a right smack travelling down the ridge after Fairfield to Great Rigg" - Dave Ashcroft. Similarly don't be tempted by St Sunday Crag or the Grisedale valley dropping to Ullswater. With wind from the WNW 'ish' these will be in the lee of Helvellyn. Gliding down the main valley after Seat Sandal, you may go further than you first estimate. The valley floor drops 177m from Dunmail Raise to Grasmere. Be careful not to contour Seat Sandal's slopes into the narrow hanging valley around Little Tongue Gill. If you've flown round the west side of Seat Sandal in a NW wind, the NW facing slopes below Great Rigg might seem inviting. However, just downwind of Seat Sandal they are not recommended for stress free flying. Kitt Rudd - "In my experience it can be a turbulent area to regain height even though it faces in wind in a north west." Approaching Grasmere the valley widens and the rougher fell sides give way to farmed fields on the valley floor. These give plenty of good landing options. You might be carrying plenty of height from your flight south of Helvellyn, making Ambleside a simple glide away. If so then congratulations. If you're low over Grasmere you might feel more comfortable landing there. Many do. The valley for about 4km after Grasmere is narrow, contains many trees and Rydal Water is definitely a poor landing option. You'll have just enjoyed the grandest section of the route. There are many flat grassy areas around Grasmere village - choose one without stock or a crop. It can still be windy here and do check the wind direction on your approach. Dave Horne - "After failing to find lift near Alcock Tarn in a light westerly, I headed out to land in the showfield only to enjoy sustained non-thermic lift over the village. After enjoying the unexpected bonus, I found I was suddenly barely penetrating northwards at height and only just made LZ, a significant northerly had sprung up all the way down to ground level. It's a real mixing bowl for air around there." However you might gain enough height round Grasmere to fly properly past Rydal. eg. Brackenwife Knotts (rocky) or the slopes below Alcock Tarn (trees) are two possible options. Above Heron Pike by Grasmere. The Fairfield Horseshoe behind. Once well past Rydal there are better bottom landing options. But some of the good looking fields aren't ideal. Many have big trees around them and if landing short of Ambleside then turbulence from the nearby high ground could spoil your landing. Mike Cavanagh - "Just when you think you've cracked the run, the inviting looking cricket pitch at Ambleside can throw in the odd googly (once had me inadvertently bouncing off the covers)." Kitt Rudd - "The cricket pitch and possibly more so the Ambleside show ground field can make for very precarious landing options at times"
With enough height to reach Ambleside, then a suitable field set in the more open ground near the town, could be a better choice. Talk to an expert local XC pilot who really knows the flight well. A pilot that says the flight is easy is the wrong pilot to talk to. Any CSC committee member will point you at the right pilot. They can help you decide if you've enough experience and brief you on the flight. A chat on flight day might reveal some useful local insight about the expected flying conditions. Walk the hills - In good visibility, perhaps you could explore Helvellyn and Browncove Crags one day and the Fairfield Horseshoe on another? The familiarity will make your flight more fun and improve decision making. OS 1:50,000 Landranger 90 (Penrith and Keswick) covers the whole route. For more detail - OS 1:25,000 Outdoor Leisure, The English Lakes OL5 and OL7. Register at http://www.walklakes.co.uk/maps/ to view the OS 1:25k maps online for free. Harvey Maps - 1:40,000 The Lake District. A waterproof map that also covers the whole route. Google Earth - Import tracklogs and 'fly' the route on your PC. Learn roughly what it all looks like from the air. GPSDump software converts IGC tracklogs to the Google Earth KML format. "IGC Flight Replay" will actually 'fly' you in 3D along a tracklog in Google Earth. Dave Robinson piloting, south of Heron Pike. Grasmere village to the right of the lake. Read pilot's accounts. A request on the CSC forum would probably get a few emailed to you. One 'accounts compilation' exists that's annotated with comments from local expert Kitt Rudd. Weather forecasts - You'll have your favourites but the Met Office and Mountain Weather Information Service both do mountain forecasts specifically for the Lake District. You should use the CANP procedure if flying mid-week. The main valley is often flown by jets and the occasional Hercules transporter plane. Airspace is not normally a concern for this flight but do check NOTAMs. The route is set in a holiday area and it's not unusual for nearby activities to result in restrictions. XC experts - Chris Scammell, Dave Ashcroft, Ed Cleasby, Kitt Rudd, Mike Cavanagh. These five have all flown the Lake District hills for many years and know the flying better than most. 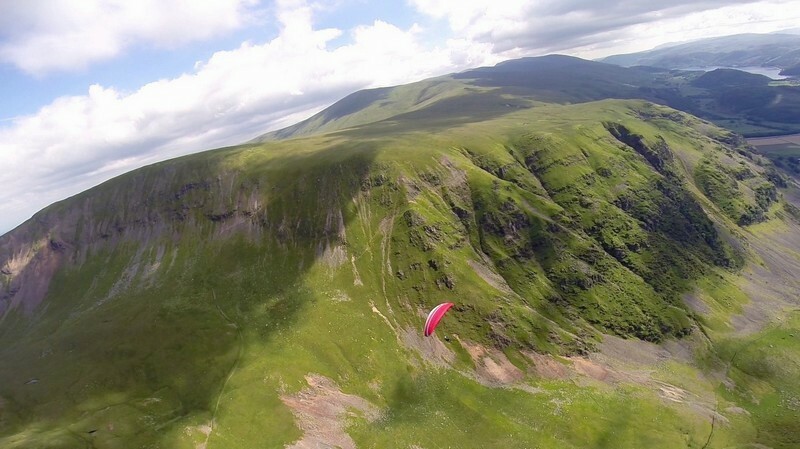 All are Lakeland pioneers, local record holders and continue to make great XC flights through the Cumbrian mountains. Chris Scammell - In 2001 completed an inspirational solo 850km vol biv adventure through the Alps. 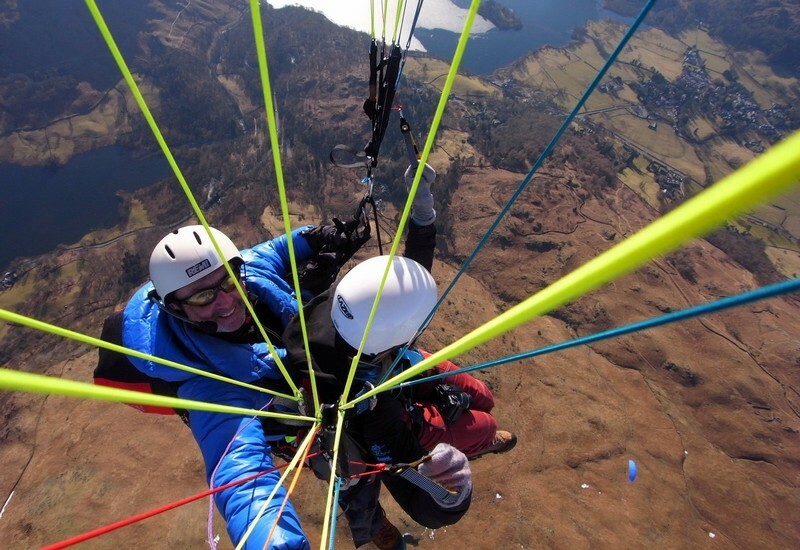 Chris likes a good triangle flight and has flown some of the biggest ever made in the Lake District. Dave Ashcroft - A superb competition pilot and the Cumbria Soaring Club's Chief Coach. Ed Cleasby - Another great competition pilot. Chief Coach of the Dales Hang Gliding and Paragliding Club. Author of 'Defined Flying Challenges'. Kitt Rudd - Competition pilot, British Team Manager and current Clough Head Open XC site record holder (140.8km). Mike Cavanagh - Current UK national XC paragliding champion and MD of paraglider manufacturer Ozone. Regular local pilots - Brian Doub, Dave Horne, Geoff Moss, Jim Bittlestone An enthusiastic bunch but no record holders here. Brian's making some good XC flights through the hills and is the current editor of the CSC e-magazine 'Spoilt For Choice'. Map used for these notes. All the place names, heights and grid references in these notes are taken from the Ordnance Survey 1:25,000 scale maps. This article is available to download from this link (A4 pdf - 19MB)."